We're seven days away from E3 2012. That's seven days until we see Nintendo's full vision for Wii U, the next round of 3DS games and how our next year of Nintendo gaming is going to look. It's the most exciting time of the year, and it's nearly upon us. Last year was pretty exciting too. We saw Wii U for the first time, got our first looks at a range of new 3DS games and welcomed the eShop into our lives. Let's take a look back over some of the best moments of 2011's E3 conference. Shigeru Miyamoto loves his music: he created Wii Music and plays the banjo, so no wonder he was so excited to be put on stage in front of an orchestra at the start of E3 2011. The show opened with a medley of music from The Legend of Zelda over the years, but it was Miyamoto's joyful play with the orchestra that we'll always remember. Just look how happy he is when he "gets an item". We'll never know that kind of happiness. What's better than a new Super Smash Bros. game? Two new Super Smash Bros. games that link together, of course. Satoru Iwata got the biggest cheer of the day when he told the audience that Masahiro Sakurai had the idea for Smash Bros. on Wii U and 3DS. Iwata might have jumped the gun a little bit — Sakurai still put in another eight months of work on Kid Icarus: Uprising — who can blame him for getting the fans onside right from the start? Not so much a moment as an impressive demonstration of technology. Faced with the issue of translating 3DS's stereoscopic screens and Wii U's two-screen approach, Nintendo went with a multi-layered stage that came alive during a demonstration of its upcoming 3DS games. We'd heard plenty of rumours about Wii U's new controller in the run-up to E3, and while its design was a surprise, perhaps its concept wasn't. One thing that did definitely surprise was the following tech demo, which like the GameCube's excellent Rebirth demo had an organic atmosphere, following a bird through a peaceful Japanese garden. As a demonstration of Wii U's technical power it probably didn't have the "wow" factor of other Nintendo tech demos — particularly considering there was no Link — but it definitely delivered in the class department. When it came to deciding who'd announce Smash Bros. Wii U, we bet Iwata pulled rank on Reggie, leaving the Regginator to lift the lid on the Nintendo-published LEGO City Stories. While we all thought "LEGO GTA", Reggie's pause for applause was met with silence. Still, we expect this to be a big seller on Wii U: it is LEGO GTA, after all. Of course, we all remember our first look at Wii U and that tantalising new controller. The concept video revealed all-new functionality: streaming from the console to the touch screen, video chat and genuinely new ways to play. It may not have been communicated perfectly — confusion mounted over whether it was a new console or just a new controller for Wii — but it left us eager to know more. Nintendo's E3 2012 press conference is on Tuesday 5th June. We'll be covering it all live — come join us. I did really enjoy when they showed off the 3DS games, very effective way to do it. going from lego island in my past to lego city stories will make me one happy ghost. I loved it when they shewed off the 3DS games. It was the first timenI found out all the E3 news by watching the whole thing. 09, 10, and 11 were all very good E3s. Same here. There was some psuedo-3D effect to it (especially Kid Icarus Uprising when Pit floated towards the camera). I can't wait for this E3. Next week is going to be huge! E3 is just one week away actually. But this year will be their best E3, imo. I wondering that too..!? It's ONLY 1 week away, and i can't wait! Aww yeah. That Zelda moment was awesome. Wii U: It better be able to have a player on the controller whilest some guy is using the TV for a different game. Imagine multitasking. It would be so fun. I think this idea is great. E3 last year was great. This is going to be one long week, waiting for Nintendo's press conference next week. I'm more looking forward to 3DS game news than Wii U. I guess that's because I have a 3DS right now and am loving it a lot. I sure hope Luigi's Mansion 2, Animal Crossing and Paper Mario get release dates and I'm of course hoping for even more new 3DS games to be shown. Oh man. Watching those 3DS stage demos was like watching 5 short movies. And when I saw Luigi's Mansion 2..... I flippin' lost it!!! I loved the new 3DS games presentation, really cool. I hope they do something like that this year for all the new games. E3 2011 was great, but E3 2012 will be even better! Nintendo just keeps getting better and better. Only about a week left now... Can't wait! First of all, I can't wait and second of all, Mr. Miyamoto plays the banjo? Interesting. I forgot how incredible that stage was. That must have been stupendous live. My favourite moment was when Reggie asked himself the hypothetical question of what the Wii U stood for. "Is it unique, unifying, maybe even utopian?" I've never laughed so hard in all my life. So bad! This was, hands-down, the worst E3 I've watched. Ever. Even worse than E3 2009- because at least that had NSMBWii, SMG2, and M:OM. This E3 stank up the room. Wii U revealed with barely any games, all games shown are running on PC or 360, 3DS gets a sizzle reel with a small selection of games aaannd... that's about it. On the non-Nintendo side of things it was all grey-brown shooters and not much else. Wait so can anyone explain this to me...So wii U is a whole different system? It is not just a controller for the Wii right? Cuz Ive heared people telling me that the Wii U is a controller to the Wii. So is it a seperate system or a controller? Thanks in advance. I loved the 3ds presentation, but as for the WiiU, it wasn't as epic and made me feel as if they decided to announce it at the last minute. I know nintendo will redeem themselves with the WiiU this year by delivering a clear message that the WiiU is a new console that can do much more than the Wii. I didn't like 2011 E3 a lot, but it sure does beat the hell out of 2008. My reason is that they only showed one new 3DS game, which was LM2. 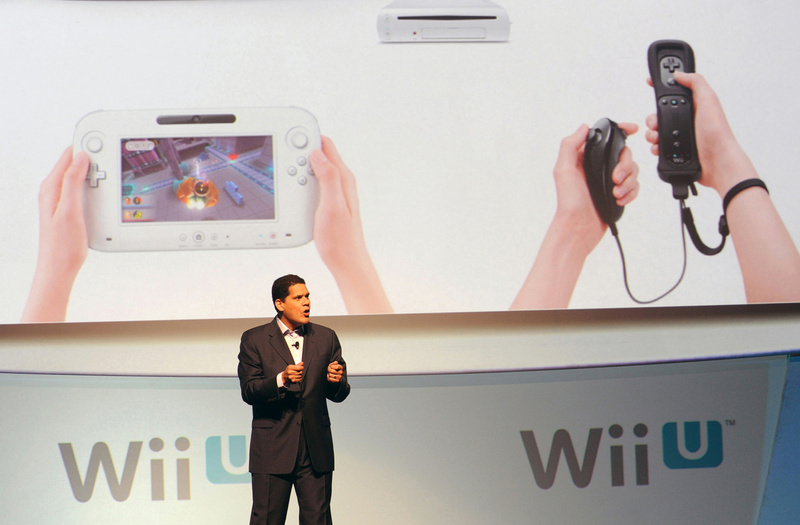 Other than that, the Wii U just raised more questions. Now don't get me wrong, the opening was fantastic. And in conclusion, I shall say that this years E3 will be the biggest for Nintendo so far. Plus, I just want to know what game Retro Studios is working on! I can't say that 2011's E3 was that overwhelming but it was pretty acceptable. The stage projection thing was phenomenal. They must have been working on it for months. I'm really excited for this year's E3 and Nintendo's presentation should better live up to my expectations. Well, comment #23 shows us just how abysmal their display/naming of the console was... lol. I'm still hoping for that name change btw. I hated the Nintendo 2011 conference. Too much teasing and not enough substance regarding the Wii U. Needless to say it left me with a serious case of gaming blue balls. It was a good showing from Nintendo but, per usual since around 2007, the lack of Pikmin 3 still left me with a slightly bitter taste in my mouth. Thankfully, 2012 will be different! The golf swing when showing off Wii U. That was my highlight of all of E3. I know what you mean though, 2011 was mostly promises and things we already knew about. 2010 on the other hand was awesome. It was jammed full of real trailers for unseen stuff we actually wanted. I hope 2012 can recreate that feeling of 2006/2010. Truth to be told, last years E3 gave me nothing with the expection of the captain obvious confirmation that the next smash bros game's going to be made eventually. Last year was my first E3 I attended, and actually being in the Nokia Theater during the Nintendo Press Conference was pretty magical. I won't be there this year and am feeling the hurt.... but it'll be fun to experience it again the way the rest of the world does. Can't wait.